As with all of the Sudokus on this Website, you can download, view, and print these puzzles for free. Instructions are included on each puzzle sheet. Why our puzzles are the best you'll find anywhere on the Internet! Large print sudokus are sooo easy on the eyes. And its easy to fit the numbers in the boxes. Printable puzzles fit perfectly on regular paper. The pages with the puzzles are completely ad free. So you're not printing out the ads! The easiest puzzles available and the hardest! ...and everything in between! Neat, clean, professionally-formatted puzzles look great. 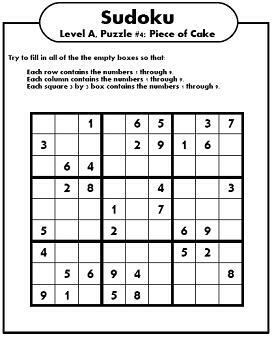 Printable sudoku puzzles features the highest-quality free sudoku puzzles you'll find anywhere on the Internet. The puzzles on this site are all saved in pdf form and are designed to print perfectly from any printer, on any computer. All of the puzzles on this site are free, so enjoy them! The Sudoku Puzzles on this site have large-print and bold letters that are easy to read.